Safe Size: 26" to 48"
Locking System: Optional 3-wheel numerical lock and Time lock. Comprehending the varying desires of our patrons, we are occupied in offering a world class range of Godrej Forte. Sha Amichand Manaji & Co.
To furnish the varying desires of our customers, we are immersed in offering a world class consignment of Safe Locker. A safe (also called strongbox, coffer or kist) is a secure lockable box used for securing valuable objects against theft or damage. 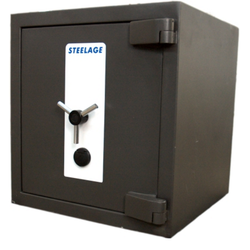 A safe is usually a hollow cuboid or cylinder, with one face removable or hinged to form a door. The body and door may be cast from metal (such as steel) or formed out of plastic through blow molding. Fireman India Security Solutions Pvt.Ltd.